Cross-Cut – This type of shredder cuts paper into smaller bits and is much more secure than a strip-cut paper shredder. 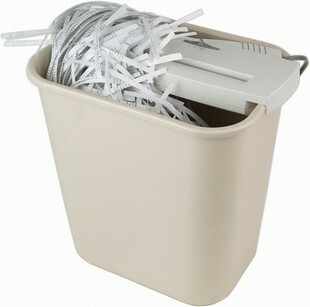 Large capacity – The container or basket should hold at least two weeks worth of shredding. This entry was written by Elizabeth Bowman, posted on March 15, 2010 at 12:16 am, filed under Business Organizing, Home Office Organizing, Paper Management, Quick Tips and tagged clutter, Electronic Organizing, general organizing, Innovatively Organized, organizing, paper, Paper Management, shred, shredder. Bookmark the permalink. Follow any comments here with the RSS feed for this post. Post a comment or leave a trackback: Trackback URL.